Some pupils of Anuli Community School, Ezinifite, Aguata Local Government Area (LGA) of Anambra State, washing hands via a tippy-tap water system provided through the intervention of European Union (EU) and United Nation Children’s Fund (UNICEF), recently. For almost five decades, Ike Theresa, 50, native of Onanaku, unmarried and childless, used to trek several kilometres in search of portable water for drinking and other domestic purposes. No doubt, many years of carrying the heavy load of water regularly while trekking could have contributed to her spine being bent backwards, causing her to develop hunched back. 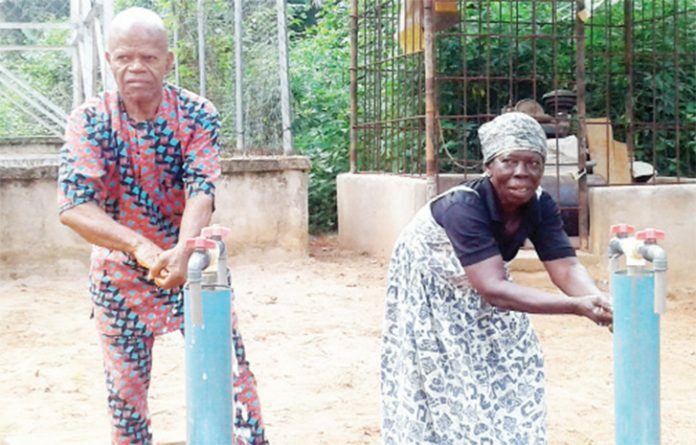 Until recently, that has been the lot of most elderly women in Onanaku, a community in Ezinifitte and neigbouring villages, Anambra state who embark on fetching water from distant towns. Before now the people used to travel far to get water for all their needs as drinkable water had been a scarce commodity for most people in the state. Aside the few rich individuals, many homes had depended on either surface or well water, which is usually contaminated. Although there is water everywhere in Anambra State, there is none to drink. DAILY INDEPENDENT learnt that to get clean potable water, one has to dig up to 650 feet above sea level. Certainly, only the rich could afford to undertake such venture. 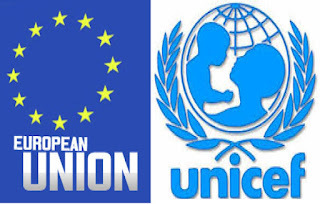 However, the story has changed with the intervention of European Union (EU) and United Nation Children’s Fund (UNICEF), which provided Onanaku community with potable drinking water. UNICEF, through funding from the EU had dug a borehole that serves Ononaku and the neighbouring villages. Today, Theresa and others like her are now happy, despite their disabilities arising from their previous hardship in sourcing for drinkable water. Mr. Ike Christian, Water Sanitation and Hygiene Committee (WASHCOM) Secretary of Onunaku in Ezinifite , confirmed Theresa’s assertion thus, “For several years, Onanaku with the population of over 2,000 have been traveling for about one and half hours to fetch water from the neighbouring communities for domestic use. Excitedly, he noted that people no longer go that far to collect water anymore, attesting to early and regular attendance to school. “Women are very happy because water has made their task easier and it increases school attendance,” he concluded. He revealed that the water has been regular and the villagers have been happy using the water. DAILY INDEPENDENT learnt that there is a committee called WASHCOM which ensures that nobody vandalizes the tap. The committee also ensures smooth operation of the project as regards transportation and storage of water. There are measures to ensure quality control and these cover collection of water and sanitary compliance of compounds. “We have to taste the water to see if the water is bad or good,” he said. Similarly, Mrs. Francisca Onyebuchi, the Head Teacher, Anuli Community School, Ezinifite, Aguata Local Government Area (LGA) of Anambra State said, “I am very happy about WASHCOM intervention in the school. They provided us with water and integrated pour flush toilet facilities of 10 rooms, five for boys and five for girls. Reflecting, she said, “Before the toilet was built, we were facing serious dangers because the pupils go to toilet in the bush and the old toilets were collapsing, it was like a death trap for the pupils. She further stated that availability of water has led to cleanliness among the pupils who no longer come late to school as they do not need to fetch water and bring to school. 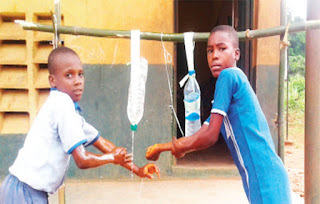 Commenting on the provision of water and toilets, one of the pupils who is also an ‘Ambassador for cleanliness,’ Augustine Emasi said, “Today, I come early to school, I even prefer to use school toilet to the one at home. Also, Okonkwo Amara, a pupil said, she has made it a point of duty to monitor the toilets and make sure they are kept neat. Mr Ezekwo Victor, the General Manager, Rural Water Supply and Sanitation Agency (RUWASSA), said that the water facility in the community is reticulated up to 1000 meters to serve farther households.